In typical interview fashion, would you be so kind to introduce yourself to our readers and tell us a bit about your involvement with Castle of Heart? Krzysztof Król: Hi, my name is Krzysztof Król and, along with Paweł Biela, I’m co-founder of 7Levels studio. I’m the co-author of the plot for Castle of Heart and I also help to manage production and take care of marketing. Miketendo64: For our readers who have never heard of Castle of Heart before, what is it and how does it play? Krzysztof Król: Castle of Heart is a classic action platformer at the genre’s best… and most challenging, with ample new twists on the formula to experience. The player takes control of a cursed knight, turned to stone by an evil sorcerer’s spell, but ready to prove that love and courage can conquer even the darkest magic. Miketendo64: Having announced Castle of Heart is a Nintendo Switch exclusive, with a Q1 2018 release, how long have you been working on it? Krzysztof Król: We started working on the game back in November 2016, so actually before Nintendo shared any official news about their upcoming Switch platform. However, we knew from the beginning that we wanted to develop a Nintendo Switch exclusive. We strongly believed that the platform would be a huge success! Miketendo64: Since Castle of Heart, is a Nintendo Switch exclusive, how have you found developing a game exclusively for the Switch and can players hope to take advantage of Switch specific features like HD Rumble, touch-screen controls and even Video Capture? Krzysztof Król: We’re huge fans of the Japanese platform and our goal is to meet the expectations of those gamers who own the Switch. After all, we’re part of that community too. Focusing solely on the Switch has given us quite an advantage over multiplatform titles. And of course, we try to implement features specific to the platform, such as HD Rumble, to make sure the gameplay experience is as immersive as we want it to be. Miketendo64: Given Castle of Heart does feature levels inspired by real-life locations, can you tell us about some of them? Krzysztof Król: The game’s surroundings are loosely inspired by real medieval locations in our region – both the architecture and landscapes. Moreover, some enemies also find their roots in Slavic fables. For example, one of the bosses is called “Żmij” – a three-headed Slavic dragon. Miketendo64: With more and more games getting a bad rep due to how difficult they are to play, how fares the difficulty in Castle of Heart? I know there is no pleasing everyone, but for lovers of the Medtroidvania genre, the difficulty is part of the charm. Krzysztof Król: Castle of Heart is not a casual game, but we have spent quite some time polishing the controls to make sure that once the player is familiar with them they’ll be able to get maximum fun out of the game. It’s important to mention that with each new level the player reaches, the difficulty increases. So it’s important not to avoid combat – this way the main protagonist will be prepared to face more challenging opponents. Miketendo64: Being in the position to play Castle of Heart yourself, how, in your own words does it handle and do you have a favourite gimmick, or scenario regarding the game, that you can share with our readers? Krzysztof Król: A great feature of our game is that every player has the opportunity to find his or her unique play style. So, depending on your preferences, you can either go for a defensive strategy or build tactics around avoidance and dodging. It’s also possible to interact with the in-game surroundings and use them to your advantage or to find additional weapons and try to win by force. Of course, it’s also possible to combine all these strategies. My personal choice is to go on the offensive. 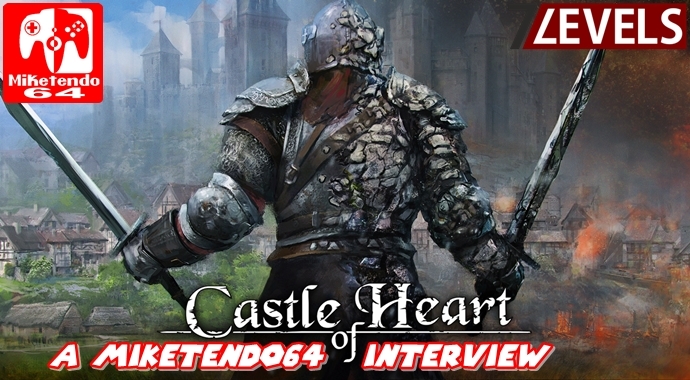 Miketendo64: For our readers looking forward to checking out Castle of Heart when it launches this month, would you mind enlightening us as to when that is? Krzysztof Król: Castle of Heart will be available in the Americas, Europe and Australia on March 23rd this year, priced at 14.99 USD/EUR. Krzysztof Król: Sure! I’d like to thank everyone who has supported our game so far! I also hope that our game will bring tons of fun to all Nintendo Switch users who give our game a go. To Krzsztof and the 7Levels team, as Castle of Heart is a game we are eagerly anticipating, we wish you nothing but the best of luck with its launch this month. You have put a lot of time and effort into the game and we can’t wait to experience it for ourselves! So, thank you.